Lightspeed is a science fiction and fantasy magazine. 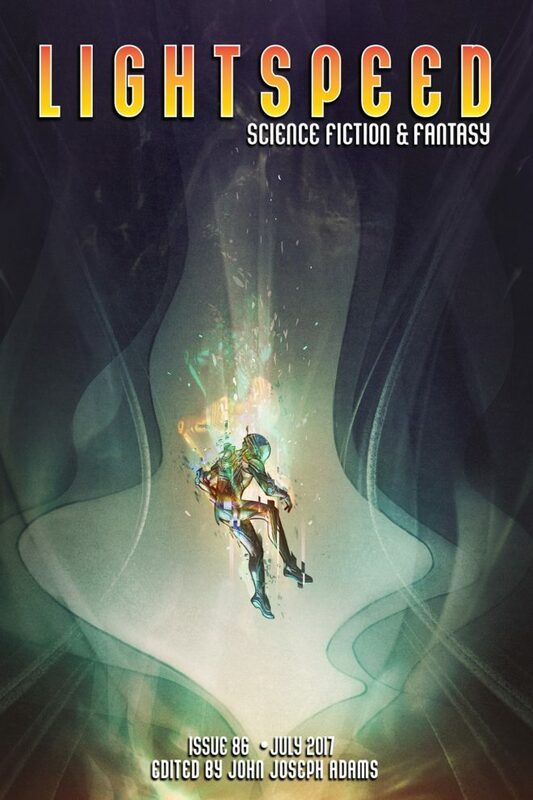 In its pages, you will find science fiction: from near-future, sociological soft SF, to far-future, star-spanning hard SF—and fantasy: from epic fantasy, sword-and-sorcery, and contemporary urban tales, to magical realism, science-fantasy, and folktales. No subject is off-limits, and we encourage our writers to take chances with their fiction and push the envelope. Edited by bestselling anthologist John Joseph Adams, every month Lightspeed brings you a mix of originals and reprints, and featuring a variety of authors—from the bestsellers and award-winners you already know to the best new voices you haven’t heard of yet. When you read Lightspeed, it is our hope that you’ll see where science fiction and fantasy comes from, where it is now, and where it’s going. Lightspeed also includes fiction podcasts, feature interviews, reviews, and Q&As with our authors that go behind-the-scenes of their stories. While Lightspeed originally published only science fiction, in January 2012, we merged with our sister publication, Fantasy Magazine, and we now publish an equal amount of fantasy and science fiction. Our current publication schedule each month includes four pieces of original fiction and four fiction reprints, along with one feature interview, one book review column, and one TV/film review column. Each issue’s contents are serialized on our website throughout the month, with new features publishing on the first four Tuesdays of every month. Additionally, each issue of our ebook edition includes a novella reprint not available in our online edition, as well as select novel excerpts of forthcoming or recently released books. You can read Lightspeed for free online, or you can read and subscribe to our ebook editions. Our ebook issues publish on the first of every month and are available for sale via our ebookstore (in Mobi, ePub, and PDF format) and are also available in other formats such as Kindle and Nook. You can also subscribe to our ebook edition in a variety of formats; visit our Subscribe page for more details. Hugo Award Winner: Best Semiprozine: Lightspeed Magazine (2014, 2015); “The Day the World Turned Upside Down” by Thomas Olde Heuvelt. Hugo Award finalists: Best Editor – Short Form: John Joseph Adams (2011, 2012, 2013, 2014, 2016, 2017), Best Semiprozine: Lightspeed Magazine (2011, 2012, 2013, 2014, 2015 [no longer eligible post-2015]), “Amaryllis” by Carrie Vaughn, “The Day the World Turned Upside Down” by Thomas Olde Heuvelt, “And You Shall Know Her by the Trail of Dead” by Brooke Bolander. Nebula Award finalists: “Arvies” by Adam-Troy Castro, “I’m Alive, I Love You, I’ll See You in Reno” by Vylar Kaftan, “The Old Equations” by Jake Kerr, “Mama, We are Zhenya, Your Son” by Tom Crosshill, “Her Husband’s Hands” by Adam-Troy Castro, “Give Her Honey When You Hear Her Scream” by Maria Dahvana Headley, “The Bookmaking Habits of Select Species” by Ken Liu, “The Sounds of Old Earth” by Matthew Kressel, “Paranormal Romance” by Christopher Barzak, “Alive, Alive Oh” by Sylvia Spruck Wrigley, “The Litigation Master and the Monkey King” by Ken Liu, “We are the Cloud” by Sam J. Miller, “And You Shall Know Her by the Trail of Dead” by Brooke Bolander, “Madeleine” by Amal El-Mohtar, “Sooner or Later Everything Falls Into the Sea” by Sarah Pinsker, “Welcome to the Medical Clinic at the Interplanetary Relay Station│Hours Since the Last Patient Death: 0” by Caroline M. Yoachim. World Fantasy Award finalists: “Breaking the Frame” by Kat Howard. Theodore Sturgeon Memorial Award finalists: “Flower, Mercy, Needle, Chain” by Yoon Ha Lee, “The Old Equations” by Jake Kerr, “The Bookmaking Habits of Select Species” by Ken Liu, “We are the Cloud” by Sam J. Miller. Stoker Award Finalists: “Her Husband’s Hands” by Adam-Troy Castro. WSFA Small Press Award finalists: “Amaryllis” by Carrie Vaughn (winner), “The Cassandra Project” by Jack McDevitt, “The Bookmaking Habits of Select Species” by Ken Liu.